Thank you for the feedback is written to help you get a good deal more from the feedback you receive. It’s a well-known saying that bread is the staff of life. I say feedback is as important to psychological and social wellbeing, as good bread is to nutritional and physical health. To be useful, bread must be ingested, digested and absorbed – and in a biblical sense, thanks given. So too with feedback, it must be received, understood and acted on – and the receipt of feedback must be acknowledged and the feedback giver thanked. Trouble is, all too often feedback doesn’t work in this way. Thank you for the feedback, explores what the receiver can do to make the most of feedback. Feedback improves our performance in anything and everything we do: solving problems at work, improving personal relationships, making play fun, lifting sporting prowess, driving a car safely, even winning online games. Feedback provides the loop that allows us to learn about ourselves from our experiences and other people. Feedback comes in many forms. It can be direct: “You missed your target this month”. Or indirect: In a meeting, the boss makes eye contact with four of the five people in the room and says: “Great job, team” – leaving the fifth wondering where she stands. Feedback comes from the animate, e.g. we beat ourselves up about what and how we did something, and the inanimate, e.g. our belt is now one notch too tight. So, let’s look at how to derive the most value and good feelings from the feedback we receive. Research shows that most feedback doesn’t effect change, even a response, in the receiver. And the major reason for this is that feedback is a two-sided process: Feedback involves a giver and a receiver. And traditionally, almost all of the focus has been on feedback giving. The art of receiving feedback has been neglected in research, training and practice. 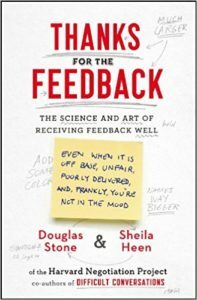 Following their best-seller, Difficult Conversations, Douglas Stone and Sheila Heen of Harvard published Thanks for the Feedback: The Science and Art of Receiving Feedback Well. The subtitle of their Introduction nails the key issue in just three words: ‘From Push to Pull’. In other words, shift the emphasis from giving feedback effectively (push) to receiving it with practical consequences (pull). The authors write “We swim in an ocean of feedback. I’ve been graded, rated, and ranked. Coached, screened, and scored. I’ve been picked first, and last, and not picked at all. And that was just kindergarten” (emphasis added). If we receive feedback with sincere intent, then we hear it, interpret it, and consciously decide what to do with it. Note, consciously deciding what to do with feedback does not mean blindly, uncritically accepting the feedback as gospel, correct and something with which we are obliged to agree. After all, it’s feedback – and even if it’s from your boss – it’s not a command to be obeyed as though from an officer in the army. Which is why saying – and meaning – Thanks for the feedback is such a crucial skill and courtesy. You want the giver to know you have heard and value their feedback. Not only to show appreciation (feedback often takes lots of courage to give), but also to encourage the person to keep on giving your feedback. You don’t want to be deprived of the opportunity, do you? Most of us have some fear about receiving feedback. And the tougher the feedback, or the expectation that the feedback is going to be tough, the greater the fear. We get anxious. Our autonomic nervous system goes into over-drive: We sweat, our heart pounds, we get angry. 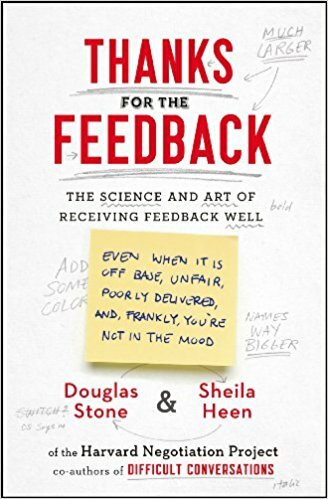 Stone and Heen explain there are three triggers that spark a negative reaction to feedback – and therefore deny the receiver the benefits and opportunity of hearing and using it. And the giver feels rebuffed or rejected. I will summarise each trigger and how as a receiver you can deal with it. First, make sure you’ve understood the content and the intent of the feedback. Play back a summary of what you think you’ve heard: Check. Separate evaluative feedback from complimentary appreciation. The difference depends on the context. “Keep up the good work” may mean “Good try, but there’s more to do” or it might mean “Well done, it’s a great job you’ve completed”. Before you react, be clear what the feedback means! Be aware of your blind spots. Remember Robbie Burns, the Scottish poet: “Oh would some power the gift give us, To see ourselves as others see us”. Separate the message from the messenger, i.e. the content from the giver. Disentangle the two. And then hold two separate conversations about each. Analyse the relationship between the giver and the receiver. What dynamics are at work? How are they interfering with how the feedback is given and how it’s being received? How can you prevent finger-pointing? Keep it cool and neutral. Positive and supportive. Yet firm with no nonsense. As the great professional services author, David Maister, once put it, work on being ‘supportively intolerant’. Get to know your own temperament and how you are wired. Know what gets under your skin – and learn to disregard these triggers. Keep all feedback in perspective. Don’t catastrophise the trivial. View these identity triggers as helpful stimuli that make you stop and think. “You could be right. What might I be like if I responded differently in future situations like this?” Use identity triggers as welcome opportunities to learn; don’t see them as insults or assaults. Do you have a personal feedback system? in which I explain how high-performing leaders regularly give themselves feedback.